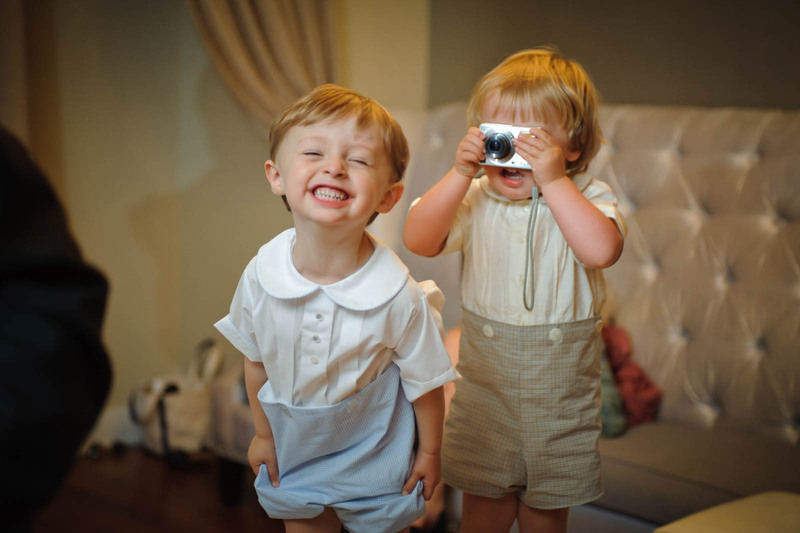 Two young boys at a wedding reception are filled with joy as one excitedly grins at the camera while another holds a small camera up to his eyes to take a photo. These little boys were so cute and so excited to watch the groom and bride walk down the isle, they couldn't stand it! I went to take a picture of them just playing but then the boy in front turned and smiled so hard his eyes closed. Then the boy the his right was so into that digital camera that he just couldn't put it down, he tried so hard to figure out why he couldn't take a picture. Why this photo is one of my favorites because it always makes me laugh, from the little boy smiling so hard and the other one holding the camera upside down.